The defense continued to try to rattle the first witness, neighbor Michelle Burger, without success. She stuck to her story that she heard a woman’s screams then gunshots. Her boyfriend testified to the same thing which the defense said was too close to the same story as the girlfriend. The girlfriend pointed out that they indeed heard the same thing- they were together. Burger’s husband, Chari Johnson, said he heard the screams then the shots. “I heard the lady scream again and the last scream faded moments after the last gunshot.” Another neighbor said she was awoken by loud voices. Prosecutor Gerrie Nel read from an expert’s report that the fourth shot was the fatal shot to Reeva’s head. 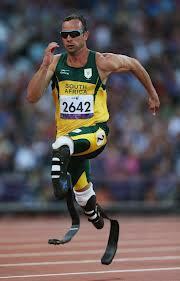 At that point Pistorius clutched his head in his hands. For more on today’s testimony and some background on this case see the link below. This entry was posted in Uncategorized and tagged blade runner, Gerrie Nel, murder., neighbors, Oscar, Pistorius, testimony, trial on March 5, 2014 by edimminger. I think they fought and he thought she was going to dump him! The trial will be televised and begins March 3rd. This entry was posted in Uncategorized and tagged blade runner, murder., Oscar Pistorius, Reeva Steenkamp, shooting., trial on February 1, 2014 by edimminger.